The answer to that question actually goes back to 2014, when I had an interaction with a visitor at the opening reception of the exhibition Inquiring Finds. In one gallery, I had hung three Op Art paintings and installed lights that slowly changed colors. The result was a gallery that visually explained color, wavelength, frequency, and positive and negative interference in a fun, groovy, and psychedelic way. Half way through the reception, I made my way to the Op Art gallery and found a woman sitting in front of a painting by Karl Benjamin giggling quietly and smiling profusely. I walked over and introduced myself. She happened to be the donor of the Benjamin and told me the effect of the shifting lights on the painting reminded her of how the work of art would look different every time she moved it in her home due to the subtle color shifts in lighting. 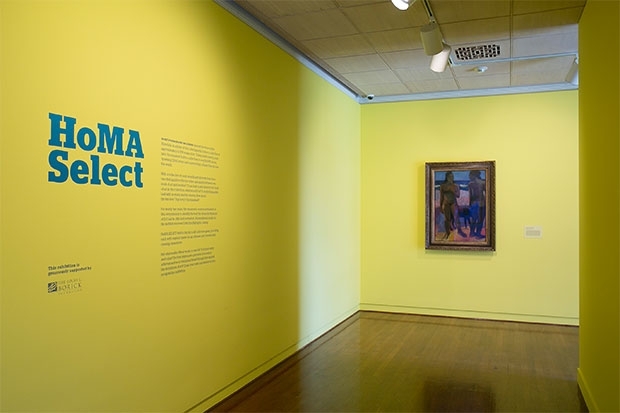 Some of the most popular and beloved works of art in the museum’s collection are included in HoMA SELECT, and it was important to me that our regular visitors have a fresh experience and see familiar works in new ways, just like that woman at the Inquiring Finds opening reception. Installing color-shifting lights wouldn’t be appropriate this time around, but using specific colors on the walls to play off works of art could certainly work. Take the bright yellow in the entrance for example. The somewhat narrow and cozy space is occupied by a single painting—Two Nudes on a Tahitian Beach by Paul Gauguin. The golden yellow light reflecting off the walls is intended to evoke a sense of warmth and nostalgia as the painting has attached to it a great story that is lovingly told by docents and those close to the museum about how it entered the collection. Museum founder Anna Rice Cooke recommended the work for acquisition and was met with great criticism. Some board members at the time felt the work was of poor taste and quality and wanted the museum to acquire a work by El Greco instead. The Gauguin being more aligned to the values and mission of the museum, Mrs. Cooke stood her ground and the rest is history. 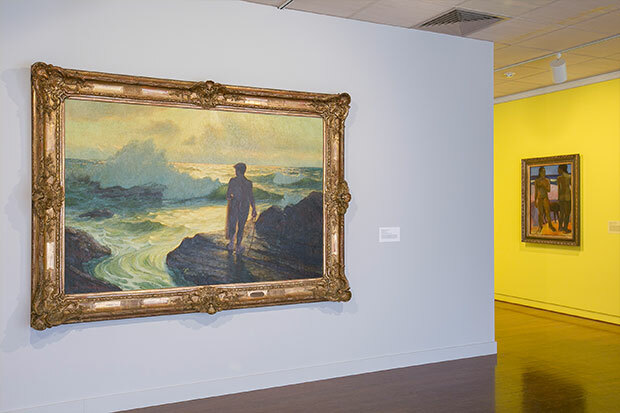 Lionel Walden’s ‘Hawaiian Fisherman’ catching a glow from the yellow wall where Gauguin’s ‘Two Nudes on a Tahitian Beach’ hangs. The yellow also plays a role in another fan favorite, Hawaiian Fisherman by Lionel Walden. In the painting is a man armed with a net, intently staring into the whitewash of the ocean looking for fish. In the background the setting sun casts a golden reflection off the churning water. Walden’s mastery of luminosity and capturing light through translucent glazing techniques earned him the distinction of being the preeminent painter of the Hawaiian seascape. The artwork hangs on the backside of one of the yellow entrance walls, and from certain views in the gallery, it is as if the golden light from the entry shines through the wall and out of the painting. There are other colors being used with specific intentions in HoMA SELECT. Check out the exhibition and see if you can figure them out. 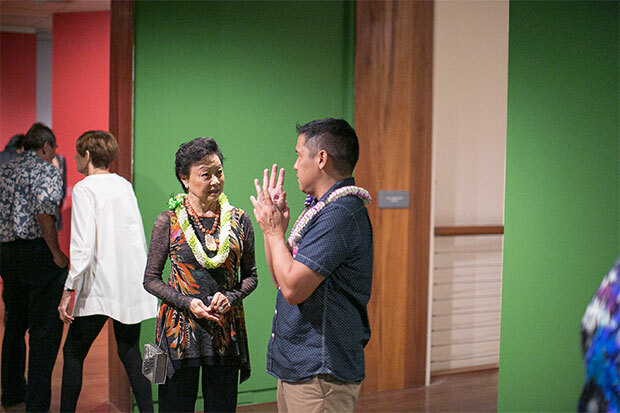 Aaron Padilla explaining his curatorial choices to Vi Loo, chair of the museum’s board of trustees.